William H. Van Rensselaer Award – Since 1988, recipients of this award are individuals who have earned recognition through their contributions in the development of a new program or improvement of a current program for Boards of Accountancy, or who influenced passage of rules or statutes. NASBA Distinguished Service Award – Since 1999, recipients of this award are individuals who have demonstrated unswerving commitment and dedication to enhancing the mission of the National Association of State Boards of Accountancy. Lorraine P. Sachs Standard of Excellence Award – Since 2008, recipients of this award are State Board executive staff leaders who have shown excellence in regulating and made a positive impact on the accounting profession. The 2019 Call for Nominations will be open March 26 – June 28. Board of Accountancy members are encouraged to submit a nomination(s), including an explanation of why this person(s) should receive NASBA’s highest honors, using the online nomination form, which can be found at https://nasba.org/mc/nasba-annual-awards/. 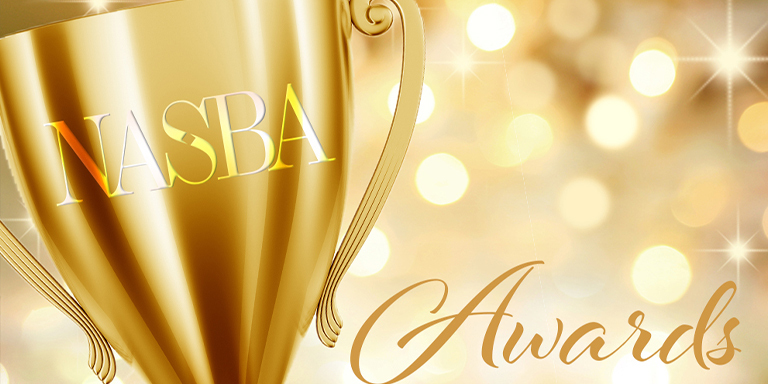 Please direct questions regarding the awards process to Awards Committee Liaison and Communications Manager, Cassandra Gray, at cgray@nasba.org.